XLIX, 188 p., 17,0 x 24,0 cm. Kant’s ›Kritik der reinen Vernunft‹ (Critique of Pure Reason) is largely a product of his lectures on logic. For this reason Jäsche’s compendium of logic, which summarizes these lectures along with Kant’s lecture notes in a kind of manual, has been an indispensable resource for those studying critical philosophy for almost 200 years. The concepts and ideas on which Kant drew are explained here. This lemmatized master index on Jäsche’s logic is the most important guide to its use. 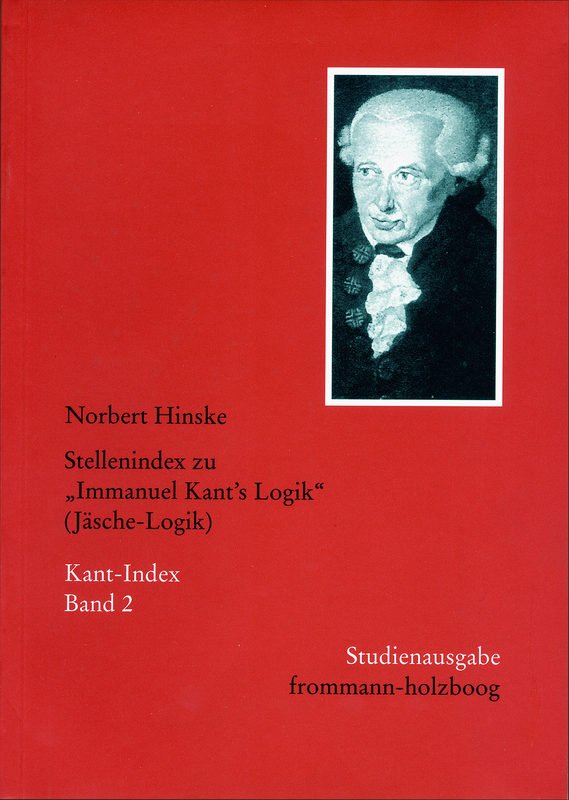 The paperback edition contains the introduction and the master index which can also easily be used independently of the other parts of the large Kant index. It is no easy matter to express in words the value of these two volumes for any work on Kant’s texts. One must simply study them oneself and draw upon them in the textual interpretation. Then it will soon become clear that they have more to offer than merely saving time; when they are used they reveal structures in the text such as not only make it possible to recognise new historical relations but are also exceptionally illuminating for any grasp of the subject itself.